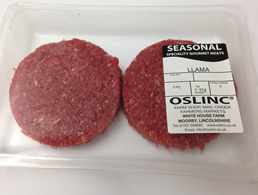 Healthy, delicious and very lean our homemade Llama Burgers are a true find for Gourmet meat lovers. The taste is similar to beef but sweeter in flavour. All our burgers are made fresh to order and packed in cartons of 2, 8 and 25.